Saying goodbye isn't easy, especially when it's your best friend. The short film below, titled Denali, is photographer/surfer Ben Moon's beautiful and touching tribute to his dog, who passed away a year ago. It is told from Denali's perspective. The moment the two met in an animal shelter in 1999, it was love at first sight. Ben wasn't comfortable in cities, so he and his pooch spent most days traveling up and down the western United States, living one thrilling adventure after the other. We can see these incredible moments captured in Ben's photos, from shark fishing to desert sailing, yoga in the the mountains, or just picking up girls. Denali's undeniable happiness shining through the lens. Tragedy struck in 2004, as Ben was diagnosed with cancer. His best buddy refused to leave his side, comforting him through rigorous treatments and procedures. 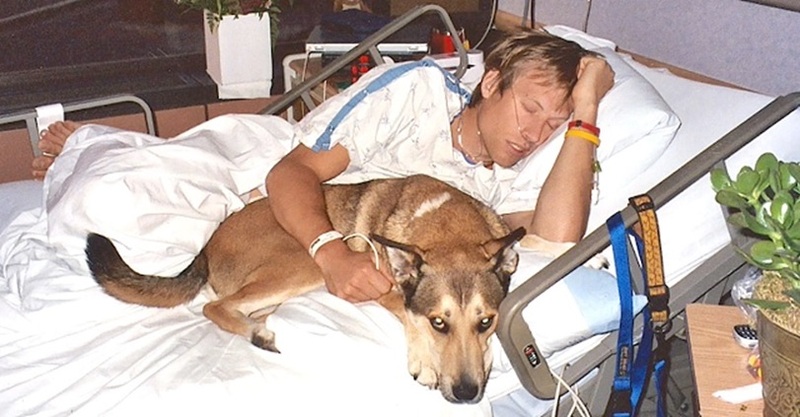 Denali's affection and loyalty played a huge role in Ben's recovery, “When he was in the hospital bed with me, he'd just sort of step up there so gently, it was kind if mind-blowing,” according to Ben. “He made sure he wasn't touching anything that was in pain and not invade my space.” The bond between them grew even stronger. “Thank you Denali for giving me the courage to hit the road with a camera, a van, and no plan back in 2001, for never taking your eye off me through a year of cancer treatments, surgeries, and countless challenges. Thank you for your uncanny ability to walk into a frame at precisely the right moment to elevate an image, for teaching me love and patience and the joy in the simple quiet moments as I watched you grow older, and most of all, giving selflessly the unconditional love that only a true friend can give.